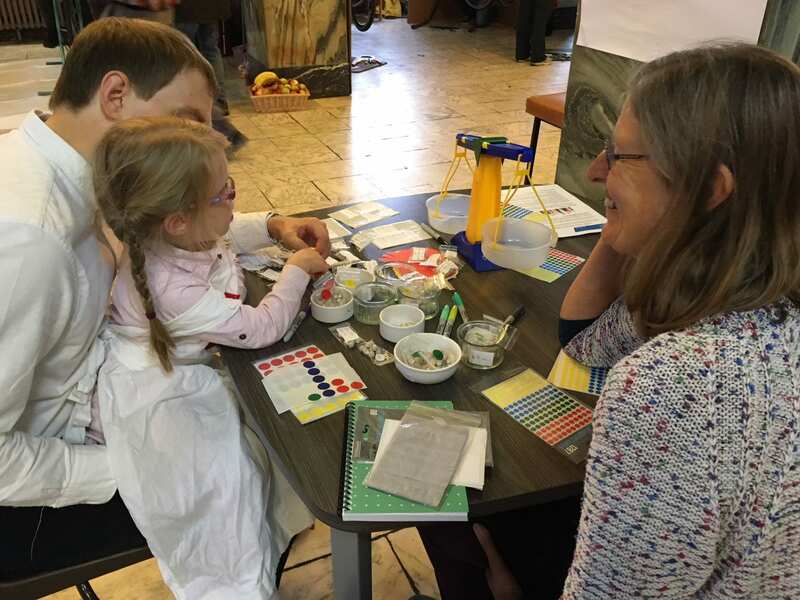 We were invited by the Elizabeth Blackwell Institute to take part in a ‘Living Well’ Fun Palace at Bristol Central Library, on the weekend of 6/7 October. The theme this year was ‘Patterns’ and the aim was to bring researchers and communities together in the same space to share ideas about health and wellbeing in a fun and interactive way. ‘Patterns’ started us thinking about patterns in GP consultations, in the sense that they generally follow a set structure. We wanted to explore how well this particular pattern worked, and whether there might be a pattern that patients preferred or components of the consultation that were particularly important or needed to be added in. We were interested in exploring the balance between i) what patients wanted (their agenda) and the GP’s agenda and ii) how to balance patients’ requirements with those of health providers. 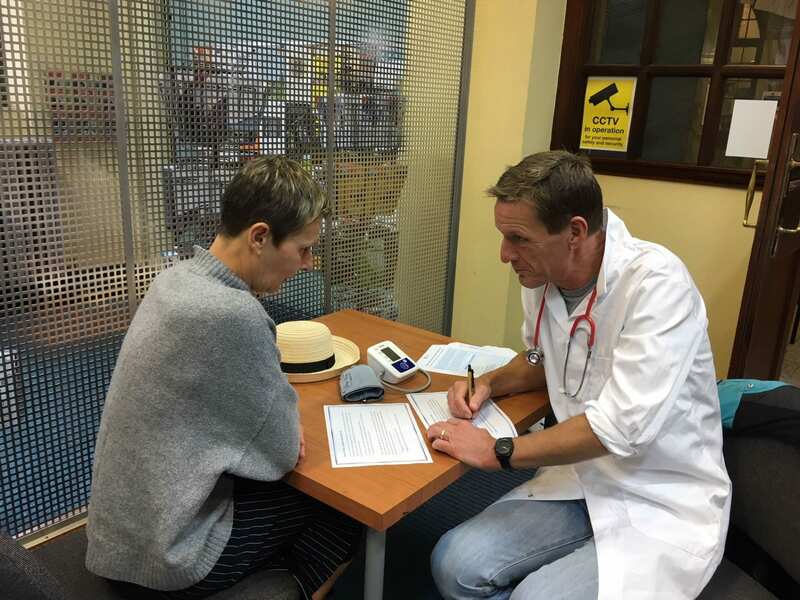 We were also interested in finding out whether sharing information about the patient’s needs with the GP before the consultation would be of benefit to both patient and GP, using an e-questionnaire Mairead had designed for the purpose. Our Fun Palace contribution, then, was on the theme of patterns in GP appointments. 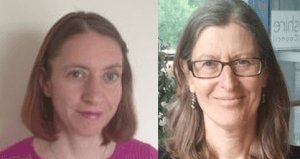 Using our past, current and planned research on patient-centred care as a platform, we planned ways of exchanging ideas about the ideal GP appointment with members of the public, using interactive games, activities and role-play. We shared the space with the other Fun Palace contributors. Walking around, participants were invited to: make their own smoothie by pedal power on a thunderously loud YoBike; decorate a YoBike with health living themes; explore links between music and the brain and find out how researchers are exploring ways to slow and prevent dementia; make poetry to explore what living well meant to them; and, finally, our own contribution, to ‘Play with your healthcare’. Activity 1: How does your GP practice work? In the first activity we asked people to play with a large star chart on the wall, measuring patient-centred aspects of their GP practice. 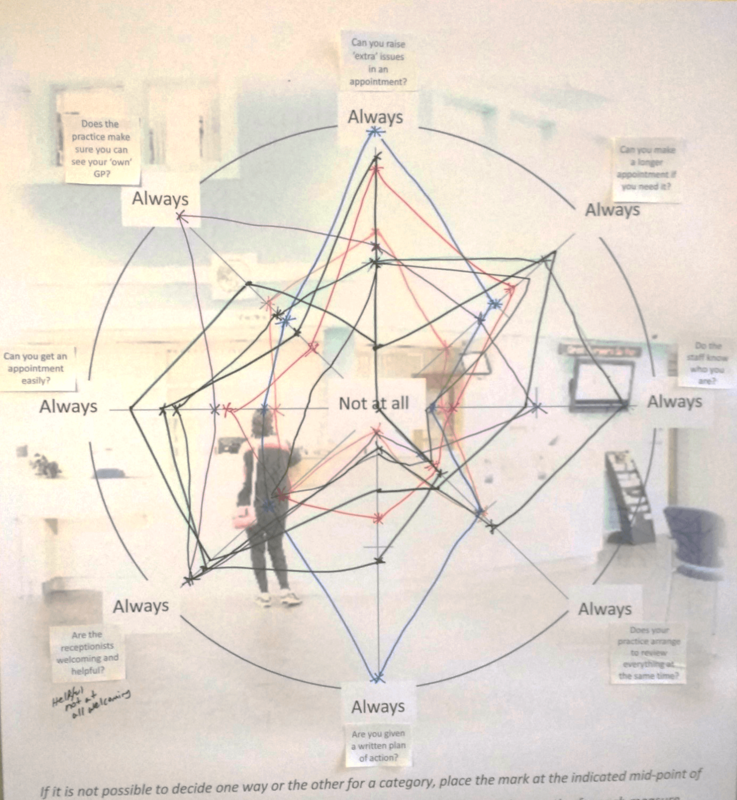 This was to explore people’s experience of the organisation in their own health centre using a ‘star’ chart to rate their experience of various features that might be considered patient-centred. Each feature was represented by a line from the centre (not at all patient-centred) to the edge of the circle (very patient-centred) and people marked the line according to their own rating of the health centre on that feature. They then joined up all their marks to create their own star on this chart. and could also cut out a smaller replica. Stuck on the wall, these made a varied picture. We found that no two stars looked alike! People also played with prioritising what they wanted in an imagined GP consultation, for example, being examined, the doctor checking their record, being listened to, or being given a prescription. This involved a balance scale, with ten weights on one side, representing the ten minutes in an average GP consultation. People chose weighted and labelled packets to put in the balance scale until the balance was tipped. Because it was difficult to say how much time each element would take, people were also able to make up their own packets and weight them according to how much time they thought they would need. Each participant then added their priorities to a wall chart, so that we could see if there was any pattern in the things people chose. There was great variation in this group as well, although one commonality was wanting to be listened to! Lastly, we did some role-play, to explore the potential benefits of using a pre-consultation questionnaire to uncover patient concerns. Pairs of participants were each given one side of a short, written scenario: one was given the patient’s information (the patient’s background, current state of health and why they were attending the GP) and one was given the doctor’s (the information from the patient record). They then role-played the consultation, and at the end, swapped sheets to see how well they had understood each other. Most ‘doctors’ didn’t manage to uncover all the patients’ concerns, and most agreed that the pre-consultation questionnaire would have helped to give a picture of what was going on before the patient arrived – for example, it would highlight if someone was really worried about a particular symptom. However, one of our ‘doctors’ (who had clearly missed a vocational calling!) uncovered all of his patient’s concerns fairly quickly through empathetic questioning and listening to his patient (and ignoring the medication review he needed to do!). So, should you do a Fun Palace yourself in the future? We think, yes; it felt like something definitely worth doing. A Fun Palace is a great opportunity to engage with the public in a public space about your research, to impart some knowledge and to learn something yourself. We had some great conversations, in particular on prioritising aspects of a GP consultation using the balance scale. We found that having an activity like this is a really useful focus for conversations and helps people to engage with ideas more concretely. Preparing for the event also made us challenge our own research: thinking about how you will explain your research to members of the public makes you question its value, how it will work in practice and teaches you about how to present it. So, will we be doing it next year? Yes, bring it on! Provided the Yo-bike is a little quieter next time! We would like to thank the Elizabeth Blackwell Institute and Ellie Shipman at Fun Palaces Bristol for encouraging and supporting us to take part. Also, colleagues Sam Creavin, Ava Lorenc and Anna King, who helped out on the day.